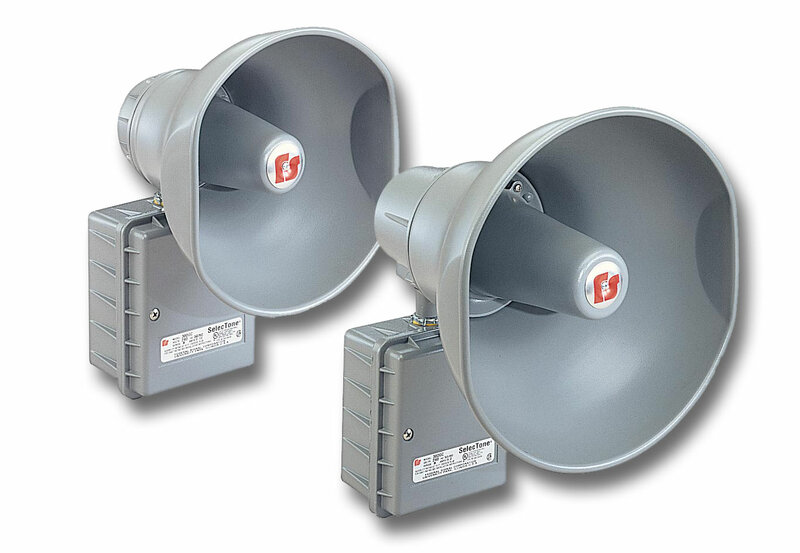 Federal Signal Models 304GCX and 314GCX Hazardous Location Amplified Speakers are designed to produce crisp, clear tones in supervised alarm notification systems. Both speakers amplifiers are compatible with fire alarm, voice evacuation, suppression supervised control panels and power boosters. These amplified speakers can broadcast tones generated by a Tone Card installed into the speaker (the plug-in 32-tone UTM*) or by a central tone source in a voice evacuation or paging system. When live public address or voice messages are required, plug-in Connector Cards (AM25CK or AM70CK) interface with the audio output of the EVAC panel. The speaker cone and projector are constructed of rugged spun aluminum. The solid-state amplifier circuit is protected in a die-cast aluminum housing. Dust and moisture-proof gaskets provide protection from the elements. All external surfaces are sealed with gray powder coat paint. The 304GCX and 314GCX are easily installed with external mounting tabs. The rugged construction and high output of the Model 304GCX and 314GCX make it ideal for use in harsh environments with high ambient noise levels.